Writing short stories requires other narrative techniques than Cosey is used to (and his readers of course). No slow developments of characters and story: these short stories have more ‘speed’ and some of them have a dream-like atmosphere. The first story of the book is called ‘Une petite tulipe rose’. It is a story of two elderly people who meet each other many years after having been in love. Cosey*: ‘It is more or less a dream: when I was in love at the age of twenty, I said passionately to myself that I wanted still to be in love at eighty’. ‘Only love can break a heart’ is the most ‘traditional Cosey’ story. An adolescent, longing for the sister of a friend, due to circumstances spends a day with the girls’ grandmother. The young boy helps the old lady to live through sad memories. Is it Bob or not? 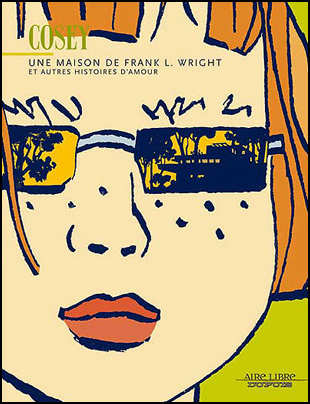 The male character of the story ‘Une maison de Frank Lloyd Wright’ made me think of a young Bob Dylan… Do you agree? *all quotes are taken from the Swiss newspaper ‘Le temps’. 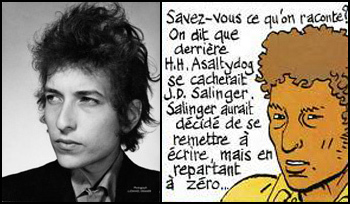 With thanks to Cédric Marzer.